Being a New England Patriots fan I was sure to watch their game with the Jets Thanksgiving night. To my horror announcers Al Michaels and Chris Collinsworth started to crow about the return of a John Madden Thanksgiving tradition, the return of Turducken. This six legged multi-bird consists of a turkey stuffed with duck stuffed with chicken. The players of the game are ‘awarded’ the turducken in the post game show and are expected to eat it. I loved listening to Madden analyze a game, but this ‘tradition’ is incredibly schlocky. Patriots Quarterback Tom Brady looked like a spectator roped onto the stage at a dog and pony show. Lineman Vince Wilfork tore into a leg playing along. Both were taking one for the NFL and NBC Sports, producers of Sunday Night Football (on Thursday). The only way it could have gotten more ridiculous would be having Coach Bill Bellichick there refusing to answer whether frankenfoul tasted good. 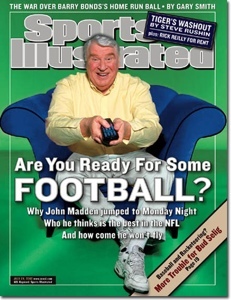 This award barely worked the first time, and then only on the mojo of John Madden. Neither Michaels or Collinsworth have that kind of mojo. Instead of recycling ideas from other networks can’t someone at NBC Sports come up with an original idea? Probably not, we are talking broadcasting. Posted on November 25, 2012, in Broadcasting, entertainment, media, NFL, Sports, Television and tagged football, madden, nbc, nfl, sports, Sunday Night. Bookmark the permalink. Leave a comment.